I need to be with my wife that i have not seen in over 4 years now. I also love helping people and there are lots of people who need help now , help me to help others , Lord , in your name i pray Amen!! I WOULD LIKE TO WIN THE “TURN BACK TIME” PRIZE FOR GWY 8800; I WOULD ALSO LIKE TO BE THE WINNER OF “$2.6 MILLION PLUS $ 5,000.00 A WEEK FOR LIFE”, GWY 8800. there IS ANOTHER PRIZE WHICH WOULD BE WONDERFUL TO WIN – $7,000.00 A WEEK , GWY 8800,(9732 9066 8019). PCH,YES,YES, I WANT TO WIN, ACCEPT ,CLAIM FULL ELIGIBILITY FOR $2.6 MILLION “TURN BACK TIME “! 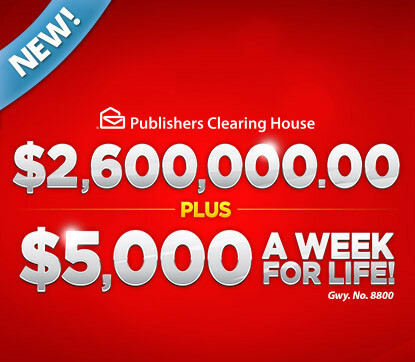 PLUS WIN PCH PRIZE GWY 8800 $5,000.00 A WEEK FOR LIFE ON DEC 22 2017! THANK YOU PCH I HOPE I THE WINNER! THANK YOU STAFF OF PCH! THANK YOU PCH PRIZE PATROL! MERRY CHRISTMAS! AND A BIG HAPPY BIRTHDAY JESUS CHRIST! Please PCH, I need to win the Giveway No. 8800 , because first of all I want to be with my wife that i have not seen in over 4 years, who lives in Singapore, but is from the Philippines. I want to meet her in the Philippines on her vacation time and surprise her, as she thinks I will never see her again. Then I want to help others that really need the money, and are living in poverty. Giving to others in need makes me smile and makes my heart feel so good. But as i said the most important thing i need to do is to see my wife soon, so that she does not give up on me. Please God help me! In your name Jesus , I pray !! Amen ! Turn Back Time Prize, Final Step. I would like to claim the Turn Back Time Super Prize NO. 8800 for December 22Nd , I have responded to all deadlines and eligibility status to Turn Back Time Prizes for $2,6 Million Plus $5,000.00 a week for life. Please activate and I will claim all prize numbers for the prizes, I also would like to claim my Prize Number. Could you please activate them. Thank You.